Lately I have been feeling a bit like superman, and no, I don’t mean that in the sense of being a multitasking working mom (which does require being a super hero on some days) . I mean it in the sense that it feels like I have two identities, Sawsan in the real world: the mother, the wife, the doctor and the food doctor or the chef in disguise a food blogger and amateur photographer in the cyber world. At first it was weird when I read people’s comments or replies referring to me as the food doctor , I can’t remember how many times I wrote my name and personal email when writing comments only to delete them or how at first I had to copy mu URL for fear of mistyping it lol (hopeless I know). Now,I can type chef in disguise and the URL to my blog faster than I can say them lol. But seriously..this is a question to all my fellow bloggers out there, don’t you feel like there are two of you..the mild mannered Clark Kent in real life and the super hero in cyber world ..
Before you read any further I have to warn you, these little guys are absolutely addictive and they are prone to disappear shortly after they come out of the oven. If you have never made your own crackers you really MUST. It is super easy and super quick, faster even than going to get them from the store. 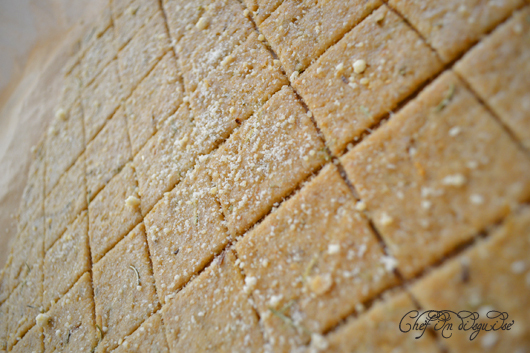 On the plus side you can make them any flavor you like, oregano, garlic, rosemary..let your imagination run wild.They are free of preservative and ready in under 30 minutes. Posted in Bread and pastry and tagged cracker recipe, crackers, olive oil, postaweek2011, rosemary, superman, wheat thins. Bookmark the permalink. I’ve never made crackers, but these look so delicious! I love the flavors too. I like your superman analogy too. I just wish I felt more like superman in real life…juggling so many things sometimes…I need a few super powers! I have never made my own crackers. It is more simple than I thought it would be. I really want to try your recipe. I’m always in need of snacks for my kids. This would be perfect. p.s. these crackers look delicious! Glad I’m not the only one who feels that way.. I thought they were difficult too! but they are so easy they hardly count as baking! I have never made my own crackers and now I am thinking that having not done it is a BIG MISTAKE. BIG. These crackers look heavenly. I love knowing what’s in them too…my own, natural ingredients. Ha, two identities for sure! I don’t think many people realize my first name is Greg. I can’t wait to try this recipe. Katherine really wants homemade crackers. So do I! i prefer home-made crackers to the store bought ones. the ones at stores have this “after-taste” which i really don’t like. i can already imagine how good these would taste when crushed in a bowl of spup … mmmmmmm! This recipe will make great use of my wonderful rosemary that I have in abundance in garden. Perfect. 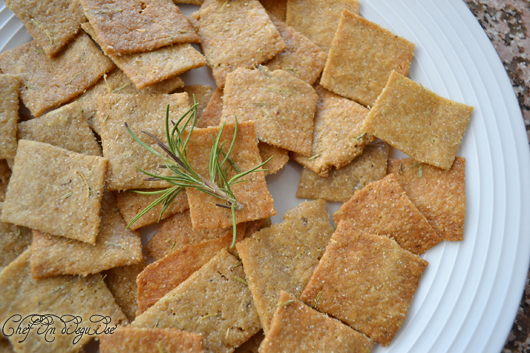 Homemade wheat thins!? I’m in. They look so delicious. 🙂 Love the addition of rosemary. oh yum!!! so that how you make them! Isn’t it easier than you thought it was? 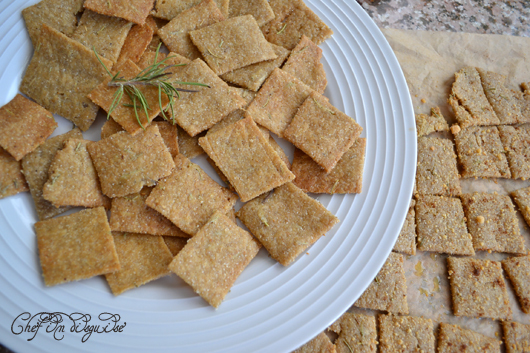 I have been avoiding making my own crackers – but it seems all the rage now! These look amazing, I am going to have to try them! And for sure I will fail!!!! I just enjoy looking at your dangerously yummy crackers. Saw these on dishfolio…. I agree, they look absolutely addiction!! Definitely bookmarked! You are most welcome Fati..
Oh what a great recipe – I think I could whip some of these up for snacks in the evening in front of the tellie. This recipe looks delicious. I will definitely give it a go as you make it look so easy! These look amazing and I can see how they would be really addictive! 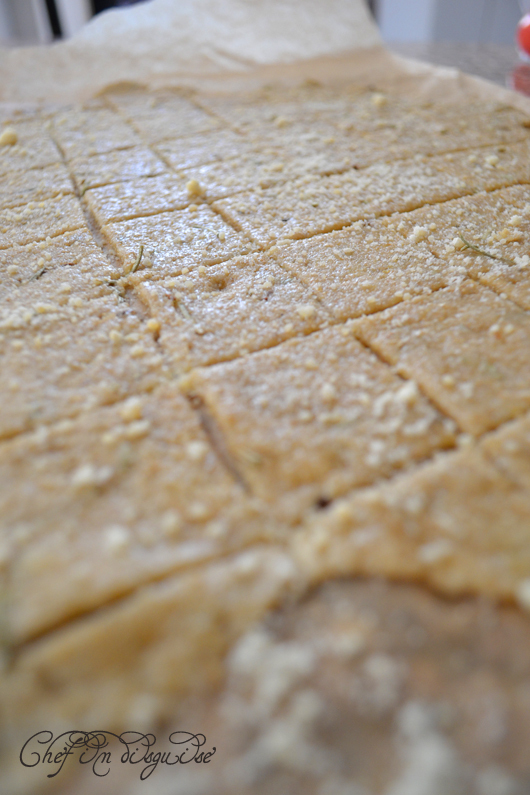 Love rosemary and parmesan together. These look amazing. Crackers are a staple and the flavors make them a fancy treat! Yes please! Crackers should have their own food group. In response to your first question, I totally understand. It does feel like there are two of me in a way, probably because I am more expressive on my blog than in real life. hehehehe…I loved that! the Bookeorminator! Homemade wheat thins? Holy heaven, I’ve got to try that! I have never made crackers before but these look so good! How can I resist?? 🙂 aren’t the irresistable treats the best ? Incredible! My crackers never come out quite as crispy as I’d like, but these look flawless. Definitely gotta take notes from this recipe!